Don't know where to turn-Plz help! 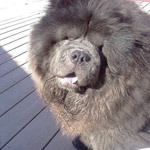 Hi - I never thought it be so heart wrenching owning a Chow! We have been the proud owner of a red male Chow for just over 4 years now, it‘s been a constant strain on our family, the poor thing is constantly having hot spots and now he is starting to suffer the occasional outbreak of ear mites, this ends in a visit to the vets but everytime cost near 100 pounds. Why do these dogs suffer so much? I did months of research before opting for a breeder and spent £1200 on the dog, started feeding him on James wellbeloved kibble as advised by the breeder but he was getting hot spot outbreaks every week so have changed his feed-over the years we have tried him with various high priced foods from the vet stores and we even started cooking him his own meals mostly consisting of veg/fish/Brown rice but still we can't find a food suitable for him-he goes to a well respected vet that says these dogs are known for having problems. It's really getting us down now, on top of this we have a disabled child to tend to, and it gets you down having to witness our pet constantly suffer. Re: Don't know where to turn-Plz help! I have one girl that has skin problems. The vet had tried steroids, allergy meds, antibiotics...but I found the most success giving her coconut oil. I put it on her skin and also let her eat it. Her skin has cleared up and her hair has grown back. Is your dog around cats? If he is check and see if your cat has ear mites. Is there any way he could be eating cat food? That will cause major skin problems for dogs. My chow chow had hotspots as a puppy. It turned out when we bathed her we did not get to rinse off ALL the shampoo and conditioner thoroughly. We also did not get to dry her thoroughly which led to inflammation and itching. We ended up buying a blow dryer for dogs and examining every square inch of her body for soapy residue. Combing her through also got all the knots and matts out. She was also allergic to grains it turned out so I switched her to grain free Orijen and Acana limited ingredient food. She also got mange and ear mites which the vet treated with ivermectin injections and mange baths once a week for eight weeks. Mites and mange are a sign of a weakened immune system so vet told us to supplement with omega 3 capsules 1000 mg and 400iu vitamin e twice a day for 60 days. Then maintained once a day for a month or so to boost immune system. Other people just give vitamin e and fish oil three times a week. I hope BOTH your babies feel better soon. 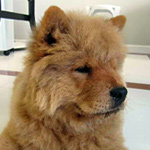 YogiOwner wrote: Hi - I never thought it be so heart wrenching owning a Chow! Hi YogiOwner- How is your Chow getting on? Sounds like I am in a very similar situation as yourself. We have a one year old girl called Lola who's currently got her 4th hotspot and is on antibiotics again to clear it up. We bought her from a very reputable breeder who fed their dogs a mixture of pedigree, chicken, rice and some tripe every now and again. They advised us to do the same and to give her omega 369 and spinach every day which is supposed to help prevent hotspots. After following all the advice Lola got her first hotspot in December. I decided to change her food to James Wellbeloved to see if this would help as it is hypoallergic. Her latest hotspot has come just a month after treating the last one so it seems to be coming back sooner. The vet said it could be numerous things -food, environment, one even suggested she could have sore stifles as she only gets them at the top of her back legs. We have now put her on a strict diet of Wainwrights grain free wet food, she's not allowed anything else, no treats or chews. I chose wet as the vet said it could be storage mites found in dry food. I've bought new washing powder for sensitive skin to see if that is the cause and I've even just bought an air purifier to see if that helps! I've only very recently made these changes and she is still getting over her latest hotspot so won't see for a while if it has helped! Can I ask where your boy gets his hotspots? Is it various places or does it tend to be just in one area? How often does he get the hotspots? I hope that you can cope as you got your hands full with a dog and a disabled child. Try bathing the chow everyweek in lukewarm water and dog shampoo. I know bathing frequently is not advised here (IF you live in a temperate region) but it does wonders on the dog. ear mites are so hard to cure even with ear drops. I tried a herbal liquid called Pau D Arco, with barks from tree and snake bile, it cured it more than the ear drops/. Now the Pau D Arco has been reformulated and contains methylsalicylate so it is NOT advisable anymore.